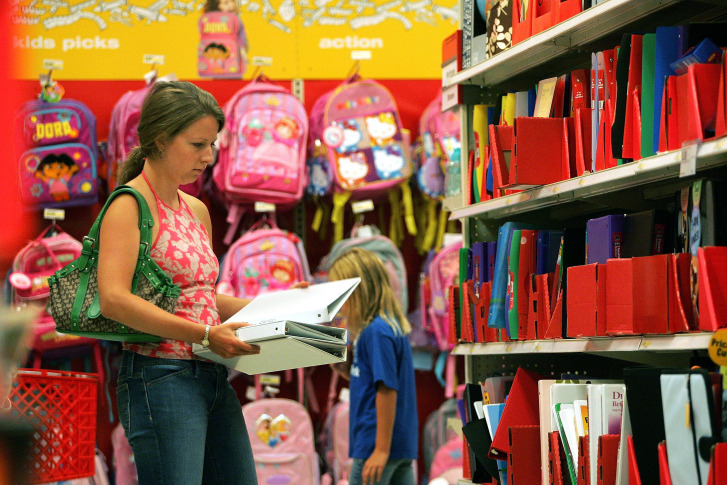 WASHINGTON — There’s a new school year on the horizon, so you — or your child — might be freaking out about new clothes and electronics. Don’t fret, though. According to Consumer Reports, plenty of stores offer discounts to elementary, middle school and college students — you just need to show proof of enrollment. If you’re online, you can fill out the site’s student-discount registration form and state the school you attend. For in-store purchases, show your student ID at the register. At Dairy Queen, high school and college students are eligible for a discount card or a “Student Meal Deal” at participating locations. The discount amount depends on the location. Regal offers student discounts for select shows, times, dates and locations. Contact your local Regal theater for eligibility requirements and availability. At AMC, select theaters have “Student Day” every Thursday. You or your child can get a reduced-price ticket price when you show a college or high school ID. Those who have the Student Advantage Discount Card are eligible to receive up to 40 percent off prepaid tickets. Participating Cinemark theaters offer student discounts. Discount days and times vary by location. Apple offers education pricing online for college students or high school graduates starting college. Parents buying for college students can use the discount to save up to $200 on a new Mac and up to $20 on a new iPad. The Sony Education Store gives online discounts of up to 10 percent for college students. To receive the special pricing, students must first register with Sony. The online Academic Purchase Program offers college students and students in kindergarten through 12th grade discounts on laptops, tablets and desktop computers. State which school you or your child attends. For those whose schools are not listed, click “Enter here to shop special deals” under “Can’t find your school?” and you’ll be directed to student deals. Student Advantage Discount holders can save up to 25 percent on purchases. With HP Academy, college students and those K through 12 can save up to 20 percent off HP products online. Other benefits include free shipping on all orders and personalized product recommendations. Registration is required. At JourneyEd, college students get discounts on software and other merchandise online. It offers discounted products for students in kindergarten through 12th grade as well. Ann Taylor and Banana Republic both offer 15 percent discounts on full-price purchases in store with a college student ID. Ann Taylor extends this offer for online purchases. To receive the discount online, register with UNiDAYS — a student discount service. Registration is free. Through UNiDAYS, other discounts are available from Claire’s, Urban Outfitters, TOMS and more. Visit UNiDAYS for the full list of participating stores. J. Crew and Madewell both offer 15 percent discounts for in-store purchases with a college student ID. Teachers are also eligible to receive the discount. Footlocker and Lady Footlocker offer 10 percent off purchases of $50 or more with a Student Advantage Discount Card, a program that offers reduced prices at various retailers and service providers. These discount cards are available for purchase online for $22.50 for one year (add $10 for each additional year). The price includes shipping and handling costs. To be eligible for this card, students have to be 16 or older. Through the General Motors College Discount Program, college and graduate students are eligible for discounts on qualifying Chevrolet, Buick and GMC vehicles. The size of the discount depends on the vehicle. See the full list of eligible vehicles here. At Greyhound, Student Advantage Discount cardholders can save 20 percent on Greyhound fares purchased online or in person. At Amtrak, Student Advantage Discount cardholders can save 10 percent on Amtrak tickets purchased three days in advance online. Through the “Good Student” discount, Geico offers up to 15 percent on certain coverages and State Farm up to 25 percent. Restrictions may apply.